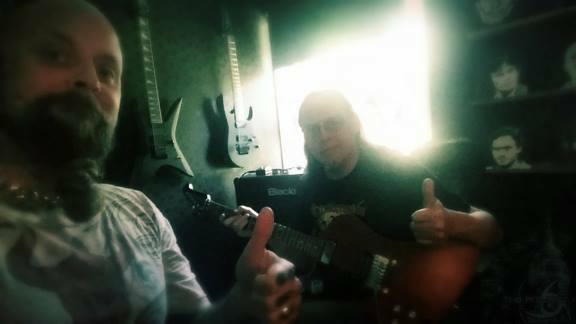 A few days ago I had the absolute honor of having Candlemass‘ gentleman Lasse Johansson inside The Dungeon. It took a mere 3 hours, including coffee and cigarette breaks, for him to put down all of the guitar solos for “Of Chaos And Carnal Pleasures” (that’s the masterful title of the coming album in case you missed out on that too). To say that it’s quite amazing to sit beside one of my fave guitarists of all time, and to have the luxury of actually recording him for fucken TPH, would be an understatement. It’s at times like these one definitely understands why I never tried to be a lead guitarist. Lasse is just amazing. And on top of that the guy is fucken left-handed. I am at loss for words. Another checkpoint crossed towards the goal of completing “OCACP”. While I am waiting for Mr. Verbeuren to track his drums, I am entering the final phase of my detail work for all of the tunes. As you know, this is an ongoing process (one I have been pretty goddamned occupied with for a long time) and to finally see the light in the tunnel on this specific journey feels so awesome. We’re moving closer to getting all the outside components finished before I can start mixing this beast with the great Mr. Swanö in Unisound in a few months, and to hear how everything is shaping up at this point is… mind blowing. Can’t wait to share this piece of audio blasphemy with you later this year. Trust me when I say that it’ll have been very well worth the wait. Until there’s something of significance to report – take good care and thanx so much for your support, and for making this album happen.